Nashville Running Company Race Team member Jeff Davis is known for many things -- his speed on the trails, mental toughness, popping quads, and perhaps, mostly, his epic adventures. Whether it be a race or "just" a weekend of running around the Smokies, Jeff tends to have the mindset of "the longer and more difficult the excursion, the better." It's apparent 2016 was no different. Here's his 2016 running recap -- prepare to be motivated to ramp up the miles and inspired to seek adventure! "Sometime after midnight in the Smoky Mountains, we sat down on a rock. The purpose of our stop was to put on jackets, but in reality, we were reaching our breaking point. “If the temperature requires a jacket, we must be above 5,000 feet”, I unconvincingly told myself. A quick glance at the watch confirmed we were still under 4,000 feet with 2,500 left to the top of Mount LeConte. After 85 miles and 25,000 feet of gain, fatigue and extreme cold led us to the unwanted decision to bail. Luckily, Jim and I had three great crew members (Steven, Lee, and Ryne) waiting with a warm car at Newfound Gap ready to whisk us away to the closest pancake house in Gatlinburg where Jim triumphantly ordered the Reese’s Pieces pancakes. The waitress bluntly told Jim that they would give him diabetes, to which Jim stoically responded, “no they won’t” and later fell asleep in his syrupy, chocolatey concoction. Oddly enough, the same Pancake Cabin was the starting point of my first running adventure of 2016. The Smoky Mountain National Park includes a great 71 mile section of the Appalachian Trail that runs east to west across the park. Ultrarunners that attempt the entire route in a single push have named it the Smokies Challenge Adventure Run (SCAR). Southeastern runners have used this route as a test piece prior to a hundred, although one could argue that this route is harder than many hundreds. On a training run, Jobie wondered out loud if anyone has run the park in a north to south direction, linking up Gatlinburg and Cherokee. A quick review of the map showed it was possible with a roughly 40 mile route over a couple of mountains. Any time you attempt something this trivial, you have to name it. Pancakes to Poker was an homage to the numerous pancake houses in Gatlinburg and the casino in Cherokee. In January, Jobie, Ryne, Nathan and I set the only known time (OKT) on this prestigious route through the Smokies. To our knowledge no one has seconded this route. A couple other OKTs were set in 2016. Nine loops of Mossy Ridge Trail (red trail) at Percy Warner (colloquially named the Tour de Rouge) and 25 repeats up the hill on the Harpeth Woods Trail (blue trail) at Edwin Warner (colloquially named Sisyphus Hill). These ‘records’ may stand for a while because most people have better things to do with their time. By mid-year it was finally time for me to race. In June, Ryne and I took our wonderful families on a pilgrimage to the trail running holy land (Colorado) for the San Juan Solstice. This is a 50 miler in the heart of the San Juan Mountains of Southwest Colorado. The race is above 12,000 feet for roughly 25 miles and reaches 13,000 feet twice. Since we both live at less than 1,000 feet above sea level, we found it relatively hard to breath on what felt like Everest. This is my all-time favorite race and is jam packed with amazing views and difficult terrain. Immersing yourself in the culture of the small mountain town of Lake City is as rewarding as the race. Not to mention the competition and race organization are both world class. Solstice should be on the bucket list for anyone that loves running in the mountains. All of my 2016 training and racing was slowly building to my long event for the year. 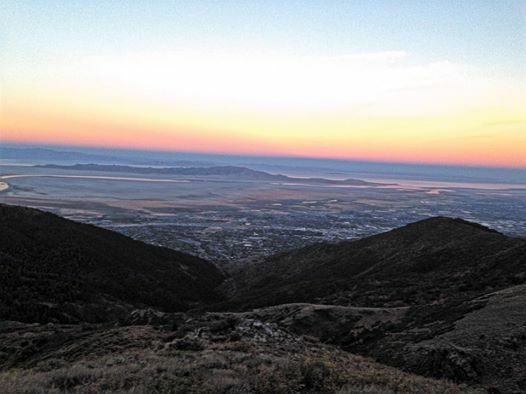 This year my family and I traveled to Salt Lake City for the Wasatch Front 100. Hunter and Matt (Vest not Hawkins) accompanied me for this endeavor. The difficulty of this race was undeniable, but with support from an excellent crew, I made my way to the finish. There is something magical about ‘running’ for over 24 hours through the mountains. Seeing the sunrise twice during a single push is something that should be experienced by any ultrarunner. After Wasatch, my plan was to hang up my Bajadas for the year, but sometimes an event is too enticing to miss. Rock Creek hosted the inaugural Stillhouse 100K, so after five weeks of no running, I decided to train for a couple of weeks and see what happened. This race is an out-and-back on the already difficult Upchuck 50K course. To make things even more interesting, the race directors decided on a midnight start. Stillhouse offered the same grassroots, old school, no frills ultra-experience that Upchuck provides. Luckily, Stillhouse provides more course marking for the night section (enough to get me back without getting lost). This race felt like a homecoming event for a lot of my southeast ultrarunning friends. This tight knit community is one of my favorite parts of the ‘sport’. My 2016 was filled with both races and self-supported adventure runs. Although very different, both genres of trail running can be extremely rewarding as long as they lead to hours in nature with interesting people. I’m very fortunate to have a wife and son that provide me with the time to pursue these endeavors, friends to share the trails with, and a running store to support my addiction. I can’t wait to see where 2017 takes me." Neither can we, Jeff! Thanks for being a part of the NRC Race Team!